It was a challenge to figure out how to display my work in my studio space for the first time. If you scroll back to the previous blog, you'll see chaos. 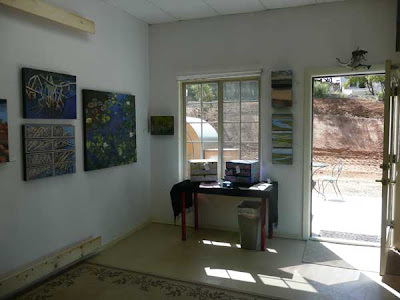 The reason for displaying the work was the Oracle Artist Studio tour, which happened last weekend. First step was to figure out where to put extraneous stuff. I started with the small items (pencils, scissors, well just about everything that was loose), and tried to figure out where they belonged. This started the domino effect, in which I went back to square one and did some basic reorganizing of drawers, shelves, etc. Which caused even more chaos. When I finally got the loose stuff out of sight, I started to move around tables and shelves. 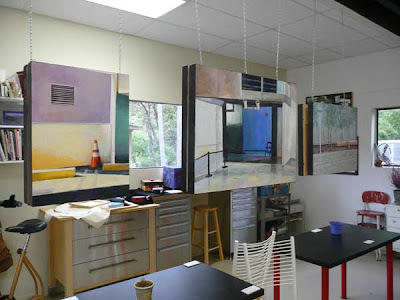 Then, I began to look at the less cluttered space and think about what paintings I wanted to display and how to do it. This brings up the perennial artist's problem of old work versus new work. Alyson Stanfield, art marketing guru, just wrote and article on her e-newsletter about where to put older work on your website. Well, where to put actual older art on an actual wall and whether to put it on view at all, is a similar dilemma. Over the years, my style has changed. It's also true that during some periods of time, I've done a better job of showing and selling my work. Other times, it's been all I could do to create work between teaching full time, being a mom and a wife, etc. So, yes, there is older work stored away that doesn't really fit with the new series I've been working on. And the older work is made up of a variety of other tangents I've gone off on. This is not to say that the work isn't good, because I think it is. It's just not cohesive. This brings us to the old fool part of the blog. Yes, you guessed it, I'm the old fool. 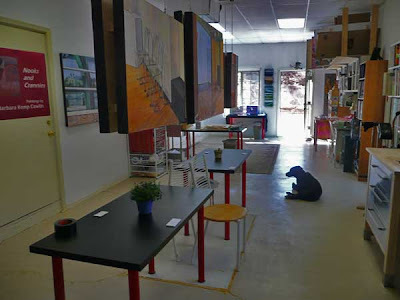 In the back of my mind, I had hoped that a museum curator or big time collector would stumble on the Oracle Artist Studio Tour event, see my work and voila, I've made the leap into the big time. And if that happens, what work would I want this elusive person to see? This just added to the agonizing about what and where to hang the paintings. Well, I compromised, and showed both older and newer paintings. Here is some work from the current Nooks & Crannies series. 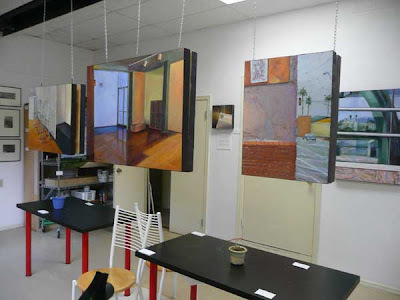 I hung some same-sized paintings back to back from the ceiling with chains and S-hooks. Thanks to Jim for his help with this. Here are the paintings on the other side. 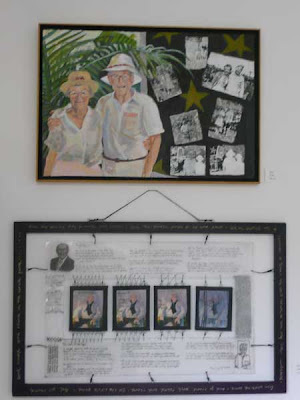 These two (sorry they're kind of blurry) personal pieces about my Mom and Dad attracted the most attention last weekend. Jim displayed some of his gorgeous photographs and the US Route 89 project next door in the unfinished garage. He did an amazing job of transforming that space. I'm kicking myself for not taking any snapshots of his set up to include in this post. And now the installation is all put away. The "pod" (teardrop trailer) was parked outside for people to see. I got so wrapped up in talking to people that I also forgot to take photos of the crowds of people who visited. It was a fun weekend. The weather was perfect. Jim grilled hot dogs, and made lemonade all weekend. I made many batches of chocolate chip cookies. I met so many nice people. Visitors were generous with their compliments on my work and my space. We both really appreciate the friends, neighbors and out-of-towners who took the time to visit us, and to visit the other Oracle artists who were participating in the tour. And no, that elusive curator/collector didn't appear (at least not that I know of). Maybe next year! And here's Breena, worn out from all the socializing she did over the weekend. Thanks, Pat. Years of doing installations for art centers etc. helps. It's always a challenge (one that I enjoy) figuring out how to make a space work. Now that I've done it once in my studio, it'll be easier to set up next time.